Each Friday, the Digest surveys the burgeoning L.A. restaurant scene and compiles this (highly unscientific) list of the newest, most hyped and heralded restaurants in town this instant. Whether big or small, near or far, these are the restaurants that have people talking. Whatever that means. Anyway, we recommend getting a seat at these places while you still can. 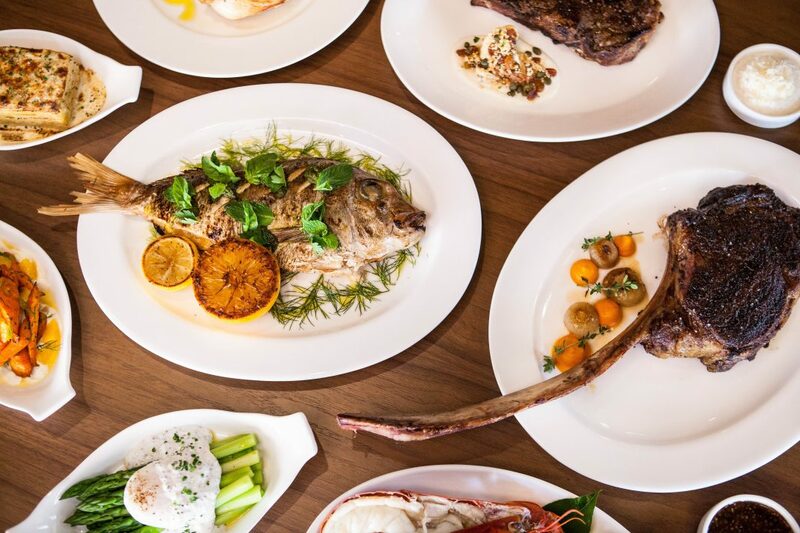 David LeFevre’s latest addition to the Manhattan Beach dining scene is the chef’s take on a retro steak house. Wet and dry-aged USDA Prime and Certified Angus beef cooked over wood fire form the centerpiece of a menu that includes chef-driven on other staples (think a yuzu kosho butter steak topper, Emmental popovers, and even Swedish meatballs). A classically inspired cocktail list lubricates the throwback Beach Cities’ vibe. With a killer West Hollywood rooftop dining area, duo-concept bar and restaurant E.P. + L.P. has arrived just in time to become one of the hottest dining destinations for summer. Aussie chef Louis Tikaram is serving Pan-Asian plates that are both playful and progressive, including wood-grilled abalone with curry paste, spice salmon larb, and “Lou Dogg’s” fried chicken with black vinegar. Alex Strauss’s cocktails menu is equally entertaining, providing tropical, quaffable drinks sure to please the late-night crowds mingling on the roof deck. Akasha Richmond, chef and owner of Culver City’s Akasha, has expanded next door to recently vacated Ford’s Filling Station space to launch her new Indian fusion concept, which blends house-made curries and regional dishes from the subcontinent with lighter Californian fare. Expect lots of action from the kitchen’s wood-powered tandoori oven. One of the most anticipated openings of the past few weeks was Jon Shookand Vinny Dotolo’s all-day Italian restaurant on Fairfax, and we’re still excited. The menu focuses on classic red-sauce fare, including crisp-crust pizza, fresh pasta with bolognese, and meatballs. There’s tiramisu for dessert. Tucked behind the dining room is where you’ll find Helen’s, a small wine shop. Dana Hollister’s One Eyed Gypsy space has shed its creepy carnival theme and been born anew as Osso, a stripped down restaurant and bar with chef Nick Montgomery (Momofuku, Blackbird, Montmartre) in the kitchen. The menu strives for ‘elevated neighborhood food,’ which means housemade charcuterie such as duck mortadella with cherries and seasonally inspired dishes like a spring pea salad, Hamachi crudo, and a 7 oz. grilled pork chop with nectarines. The spiffy booze program is the work of Cliff’s Edge’s Darwin Manahan (formerly of Corazon Y Miel and Punch). Brooklyn expat chefs Sarah Kramerand Sarah Hymanson’s stylish falafel shop inside Grand Central Market has arrived in full crunchy, vegetable-strewn glory. Choose between red and green styles of falafel wraps or salads, then take a seat at the marble counter. Beet-sumac soda and orange blossom yogurt drinks are both creative and refreshing. Hidden in a small space behind Greenspan’s Grilled Cheeseis the newst project from chef Eric Greenspan, an intimate European bistro called Maré. Pass through the sandwich shop up front to enjoy a quaint patio and dishes like clams in vadouvan green apple broth, fried smelt, and skirt steak with chimichurri sauce. The menu is as compact as the space, but packs a variety of bold flavors. What was once Girasol in Larchmont Village is now Vernetti, a retooled Italian restaurant from chef Steve Vernetti. This is neighborhood Italian, so for breakfast, lunch, and dinner you’ll find a lineup of simple dishes such as crispy polenta cakes with eggs and chantrelles, a meatball panino, and rigatoni in a braised short rib ragu. For dessert? New York cheesecake and cannoli, of course. Roving chef Farid Zadi has taken his North African taco pop-up brick-and-mortar in Jefferson Park, serving a slate of inspired tacos, burritos, and smoky meat stews with housemade saj. The quick-service joint is no-frills, but Zadi’s Algerian roots pepper the menu with far flung originality. Expect highlights from his pop-up including shakshouka tacos and black-eyed pea falafel.